Pravachol (Pravastatin) and is in a group of drugs known as HMG CoA reductase inhibitors or ‘statins’. Pravastatin reduces the body’s levels of ‘bad’ cholesterol and increases levels of ‘good’ cholesterol. Pravachol comes in tablet form and the recommended starting dose is 40 mg once a day. If 40 mg does not prove effective, it is recommended that the dosage be increased to 80 mg once a day. A starting dose of 10 mg daily is recommended for patients with significant renal impairment. The recommended dose for children 8 to 13 years of age is 20 mg once a day. 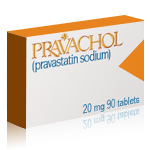 It is marketed as a generic but is also available under the brand name Pravachol. Bristol-Myers Squibb manufactures and distributes pravastatin (Pravachol) in the U.S.
Pravastatin is prescribed to manage blood cholesterol levels in people with hyperlipidemia or dyslipidemia (high blood cholesterol levels). Over time, high blood cholesterol levels result in the buildup of fats or ‘plaque’ along the wall of the blood vessels (also known as atherosclerosis). Eventually the ‘clogged’ blood vessels decrease the blood flow in the body thereby reducing the oxygen supply to major parts of the body including the heart and the brain. It is important to control blood levels of cholesterol to reduce chances of developing serious cardiovascular problems particularly arteriosclerotic vascular diseases which can lead to stroke, heart attack, and other heart complications in patients with diabetes, coronary heart disease or other conditions that increase the risk of these complications. This medication is intended to be used along with healthy lifestyle (proper diet and regular exercise) to effectively lower down blood cholesterol levels. It should not be taken as a substitute for these lifestyle changes. Your physician may recommend certain changes in your daily habits that likely contribute to the cholesterol problem. To ensure the medication is taking effect, patients have their blood tested on a regular basis. In some cases, a patient’s liver function is also tested. How should pravastatin be used? Pravastatin is taken orally usually once a day. It can be taken with or without food. Although it can be taken at any time of the time, it is recommended that you take it around the same time to maintain desired blood levels. Make sure that you read the prescription label carefully and take it exactly as directed. Ask your physician in case you have any questions or you do not understand the prescription. Initially, the physician may prescribe a low dose of pravastatin then gradually titrated to the effective dose. Normally, dosage adjustments are done after 4 weeks. Do not adjust the dose or change the medication, unless otherwise instructed by your physician. Even if you feel well, continue taking pravastatin. Regular visits to your physician are necessary to monitor your progress and response to the treatment. What is the most important thing to remember when taking pravastatin? Pravastatin can cause breakdown of skeletal muscle tissue eventually leading to kidney problems. Contact your physician if you experience muscle weakness, muscle tenderness or pain, fever, and dark colored urine. Do not take this medication if you have allergy with pitvastatin. This medication should not be used during pregnancy. Discuss with your physician any plans of becoming pregnant before initiating this drug. Use of this medication is not recommended if you are breastfeeding or have liver problems. Inform your doctor of other underlying medical conditions such as kidney disease, alcohol problems, diabetes, thyroid problems and muscle disorder. Dose adjustments may be necessary. Inform your doctor of all drugs, both prescription and over-the-counter medications, as well as nutritional supplements and herbal products that you are currently taking. These compounds may cause adverse drug interactions when taken with pravastatin. Follow a heart-healthy diet and exercise regularly during treatment.